That first cold breeze have you on the hunt for the perfect outerwear? If you’re a curvy woman, finding the right piece to hug your curves & keep you warm can sometimes be challenging! That’s where we come in. 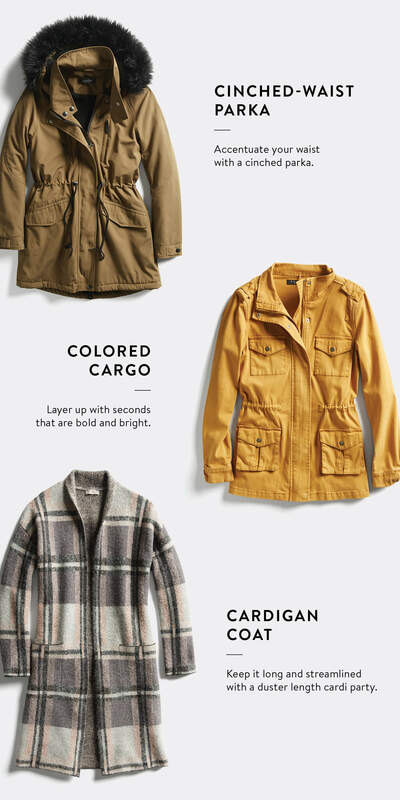 First things first, when you’re on the hunt for a new coat, keep these three things in mind. Define your waist: Belts, cinching waist ties or a tailored fit and flare silhouette are the design details to look out for. Prioritize silhouette: Look for shapes like tailored coats with a bell-shaped skirt, sleek structured cardigan coats that hug your curves and trench coats that nip in at your waist. Make the most of cold weather with a practical parka that cinches at the waist and does right by those curves. Bonus style points for details like faux fur lining at the hood. Try it over your favorite jeans and a crisp, collared blouse with a preppy vibe to play off the casual feel of your coat. Safari and military-inspired cargo jackets lend the perfect, borrowed-from-the-boys (or should we say sergeants?) feel to any casual look. Contrast the masculine undertones of this easy layer by opting for one in a saturated color like saffron yellow, burgundy or blue. Then, add it to your favorite jeans + sweater combo. Cozy and chic, the cardigan coat is the perfect piece for proportion play. They’ll cascade over your curvy frame and elongate your overall appearance for a result that’s entirely street-chic-approved. Add yours to a fitted sheath dress and heeled booties to elevate the look. With all these outerwear options this season there’s sure to be the perfect layer for every curvy girl under the sun—err, snow. Have tips of your own? Share it with us!